Lake Minnetonka Association: Is Anyone Listening? Lakeshore Weekly News Editor Brett Strusa’s Column in the January 11th edition asked whether our elected officials were listening in reference to recent City actions in Deephaven. Here, I want to talk about what lakeshore owners and businesses are saying relative to milfoil control on Lake Minnetonka. Around Lake Minnetonka, the lakeshore owners and businesses have been very clear they want milfoil controlled and are elated over the results from the results in Grays and Phelps Bays last year. The lakeshore owners represent a significant constituency and in fact have provided the majority of funding to this project as well as additional projects planned for 2010. Milfoil has been the scourge of Lake Minnetonka for over 20 years. It impacts the lake’s ecology and recreation. Indeed, in my 10 years on this job, complaints about milfoil (or the harvesters) have topped all other I have received. Right now, there are ten active bay captains or co-captains – and a dozen or so street captains - working on fundraising for the planned 2010 milfoil treatments. They have or soon will raise about $220,000 toward the 2010 projects on five bays. We anticipate receiving about $60,000 in public money as well. Lakeshore owners and businesses are making serious and significant investments to clean up Lake Minnetonka for all to enjoy as well as for improving its health. The lakeshore owners and businesses are speaking – with their investments, energy and commitment – are our public agencies listening? Some are. 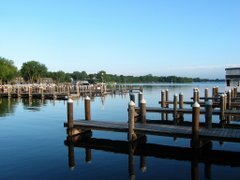 The Cities of Excelsior, Greenwood, Mound, Shorewood and Tonka Bay have committed funding toward these projects in 2010. The Lake Minnetonka Conservation District’s Save-the-Lake Fund (private donations) has committed funding. The Minnesota Department of Natural Resources probably will provide grant funding (grant application pending). We appreciate these commitments. Unfortunately, some are not. It is unfortunate that lakeshore owners and businesses ought to foot the majority of the bill to protect and manage a public resource. It is unfortunate that over $100,000 per year is being spent on old technology – the harvesters – which cut less and less milfoil each year, which have trouble picking up all the milfoil fragments, which have difficulty cutting in straight lines and which will likely facilitate the spread of flowering rush (an invasive plant newly discovered in Lake Minnetonka last year). It is unfortunate there is no long-term plan or vision for milfoil control on Lake Minnetonka. The Lake Minnetonka Association’s ‘Milfoil-Free Minnetonka’ campaign is resonating with lakeshore owners and businesses. Lake Minnetonka can be Milfoil-Free in a a manner that is safe and restorative. We know the lakeshore owners and businesses are not the only constituencies the agencies and municipalities ought to listen to. However, with respect to milfoil control, lakeshore owners and businesses are willing, enthusiastic and committed partners. We urge the agencies and municipalities overseeing the management of Lake Minnetonka to listen to lakeshore owners and businesses, tap their energy and investment and help to make Lake Minnetonka Milfoil-Free. "It is unrealistic to expect to absolutely limit the spread of milfoil, both within and between lakes. The perceptions of milfoil has been worse than the reality. While the plant is certainly a nuisance that we should try to minimize, no lake has been rendered useless as a result of a milfoil infestation. Also, there has been no definite documentation of the reduction in property values on infested lakes. People adjust. Eurasian water milfoil can be tolerated."